Post-Impressionism is an Art style that developed in France after Impressionism, as a rejection of this style inherent limitations. In Post-Impressionism are included several late 19th century painters, among them Cezanne, Gauguin and Van Gogh. A majority of them began their carrier as painters in the impressionist style but then they abandoned it in search for a more personal way of expression. These painters did not have enough with the mere depiction of nature in which Impressionism was based. 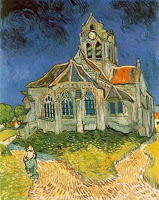 They preferred a more ambitious expression, even without denying the pure and brilliant impressionist colour and its freedom from traditional subjects and techniques. The work of these post-impressionist artists was the basis for several contemporary trends in painting. -Interest in building the shape, the drawing and the expression of the objects and human images. -Use of colours that create contrast to distinguish plans and shapes. -Pictor ical effect based on structures, both spatial and chromatic. 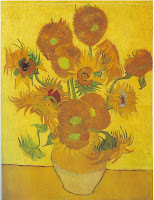 -Use of pure colours with enormous emotive weight (Van Gogh) or modulate (Gauguin). -Full of imagination creations bases on curved brushstrokes that try to express the anguiss and interior insanity (Van Gogh). -Interest in the exotic (Gauguin) or in the life of the out-of-class (Toulouse-Lautrec). -Creation of simplified and static compositions, seeking for the harmony of the chromatic masses limited by well defined profiles (Gauguin). 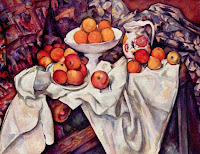 -From the impressionist the taste for colours in Cezanne. -From Rubens, the neoimpressionist and the japanese cards the rich chromatism and the curves of the shapes used by van Gogh. -From the exotic cultures of Oceania the primitivism of Gauguin. He started painting with Pissarro. He left the comfortability of his life and family to live first in Paris, then in Bretagne and finally in Tahití. His painting is characterised by the use of strong tonalities, with alive and many times arbitrary colours that he distributed in big plans limited by curve lined rhytms. He had two main subjects: the exotism of Tahiti and the primitivism of Bretagne. 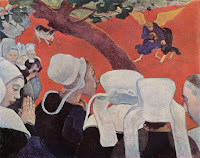 His work was a reference for the symbolist and his sense of colour was influential on fauves and expressionists. He renounced to the perspective, supresed modeling and sades and identified the sensation of flatness, the same as in Japanese paintings. His painting recovered the volume thanks to the geometry, drawning and the definition of the shapes by using building brushstrokes. He managed to do all this without renouncing to the intensity of the colours by using contrast and coloured shades. In his paintings there is an special interest on the foreground and he realized small distortions as a result of the use of multiple points of view, as in the case of his still-lives. 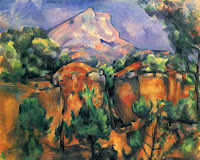 His painting was the basis for the cubism and influenced in Matisse colours. He painted series as those of the Cards Players and Sainte Victorie Mountain. He was stablished in Arles enthusiasted with the light of Provenza and he painted images and landscapes with curved and mobile formes, similar to the flames of his internal fire. He was a pasitonated of the colour as the vehicle for expressin the frequent depressions and anguishes he suffered from. His brushstroke is very characteristic, sinuous, cursive and with a lot of matter. The colours are sometimes aggressive, with unfrequent contrats –yellow over orange-. He openned the way for the expressionism of the 20th century. Works: Self-portraits, Stary Night, Sun Flowers, Doctor Gadget. He reflected the atmosphere of the night salons, full of dancers, singers and prostitutes who became his models. In his technique drawing is essential, to capsize movement in an ironic and caricaturesque way. He was the impulsor of wall-papers. Works: Moulin Rouge.